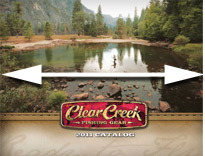 Clear Creek built its reputation making protective cases tough enough for top fly rod manufacturers. But capturing the attention of discerning fly fishermen meant looking at the brand from a whole new angle. Countless interviews with Clear Creek reps revealed a brand in need of rejuvenation. Products were well-constructed but lacked that "cool factor." Brand awareness was low. Even the logo was best described as "non-descript." With just one look, the redesigned Clear Creek logo tells a story to the audience—a story of craftsmanship, heritage and lasting values. Classic styling appeals to those who have loved the sport for years, while the distressed treatment and color and style variations keep the brand relevant for the next generation of fly fishermen. Taking our inspiration from the old metal signs often found at marinas and gas stations, the resulting logo design blends new with the nostalgic, fresh with the familiar. 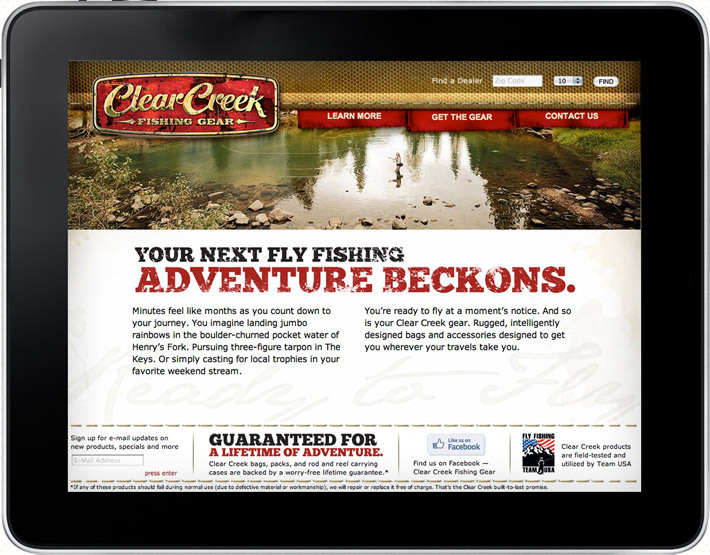 With look and feel firmly established, Clear Creek needed a voice—one infused with the energy, exuberance and passion of the fly fishing experience. 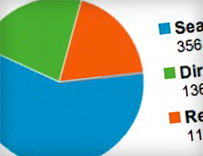 One that says as much about the people who use the gear as the gear itself. "Ready to Fly" captures that barely contained, "can't wait to be there" feeling—that moment of freedom where the only things that matter are the sounds of the water and the arc of the day's first cast. It also tells fly fishermen that their Clear Creek gear is ready to go when they are, with rugged construction and well-designed features that protect their gear when they're on the fly. 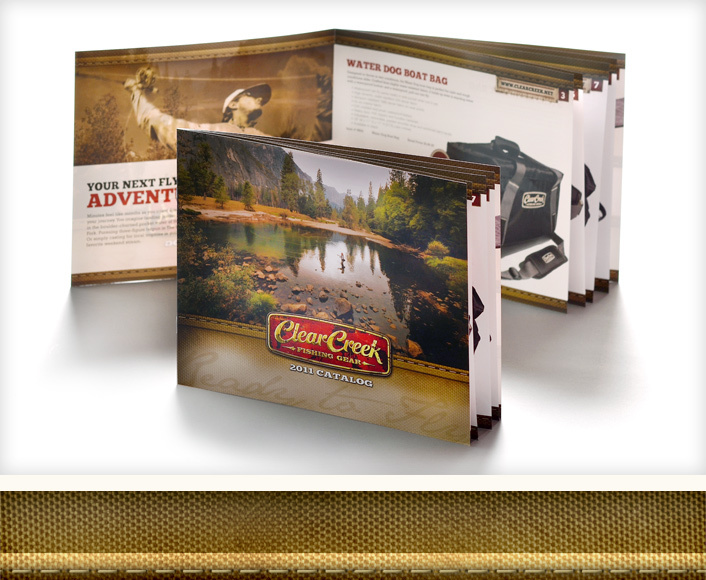 Casting typical vertical formats aside, we created product brochures in a 10x8 horizontal format to help Clear Creek stand out on dealer displays. Close-ups of fabric and stitching details highlight the quality construction of each Clear Creek bag. Clear Creek’s gear bags are the very face of the brand. 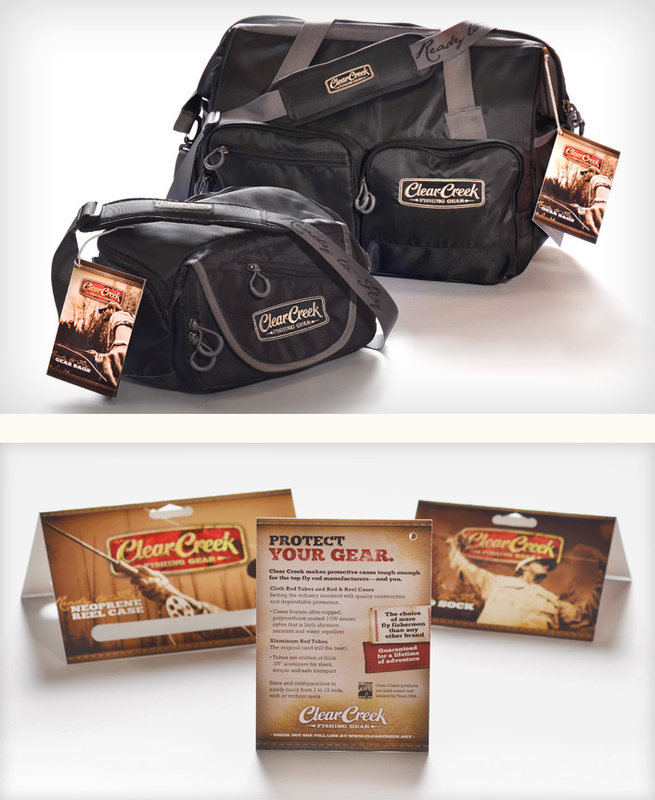 So when Clear Creek began developing its new line, they sought our help in giving the bags a well-deserved facelift. The result is a collection of high-quality bags that are not only the epitome of function, but a highly sought “must-have” for the fly fishing enthusiast. Sporting branded hang tags and names ranging from Water Dog Boat Bag to Rum City Rod Carrier, the products deliver undeniable shelf appeal and a sense of adventure. Working closely with our client, we scrutinized every aspect of their new gear bags, from fabric selection and stitching details to zipper pulls and logo placement, to ensure the product design and brand were in complete harmony. Drawing on that "unforgettable fly fishing experience," Clear Creek's new website pulls readers in while showcasing their durable, well-crafted gear. Simple and intuitive, the site makes finding the right gear a breeze. Perfect for those who would rather be casting a stream than surfing the web. Adding analytics to the new site gave Clear Creek the power to track and analyze their traffic data, helping them to make better, more informed marketing decisions. Building on what our client describes as a "tremendous response to the new bag line" at the International Fly Tackle Dealer Show in New Orleans, Clear Creek's new bags—and new brand—have received high praise from reps as well as coverage in key trade and consumer publications. Better still—Clear Creek is generating brand recognition among passionate fly fishermen who need to protect their tackle when they're on the fly.